While it’s often referred to simply as an “alignment” or “wheel alignment,” it’s really complex suspension angles that are being measured and a variety of suspension components that are being adjusted. This makes an alignment an important suspension-tuning tool that greatly influences the operation of the vehicle’s tires. 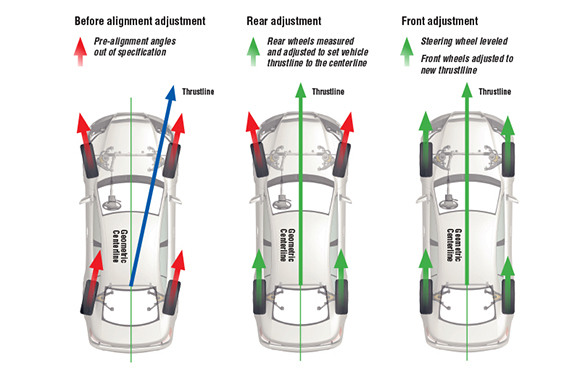 Out-of-alignment conditions occur when the suspension and steering systems are not operating at their desired angles. Out-of-alignment conditions are most often caused by spring sag or suspensions wear (ball joints, bushings, etc.) on an older vehicle. They can also be the result of an impact with a pothole or curb, or a change in vehicle ride height (lowered or raised) on any vehicle regardless of age. Incorrect alignment settings will usually result in more rapid tire wear. Therefore, alignment should be checked whenever new tires or suspension components are installed, and any time unusual tire wear patterns appear. Alignment should also be checked after the vehicle has encountered a major road hazard or curb…an alignment and important suspension-tuning tool that greatly influences the operation of the vehicle’s tires…incorrect alignment settings will usually result in more rapid tire wear. The Service Center expansion walls are up! Our drive in service area will be over double the size. This will eliminate the line at the door, and allow everyone to pull right in and meet with an advisor. Upgraded state of the art equipment in our shop including a new car wash, alignment equipment, lifts, and diagnostic tools. Brand new Express Service bays and equipment specific for providing express service. An expanded shop with increased capacity, and additional detail bays to better serve our customers. 1. Preheat oven to 250 degrees. Line baking sheets with parchment paper. 2. Combine butter, corn syrup, and cinnamon candies in a bowl over medium heat. Bring to a boil, and cook for 5 minutes. Pour the syrup over the popcorn in large, heatproof bowl, and stir to cover the popcorn as evenly as possible. Spread the popcorn out onto the prepared baking sheets. 3. Bake in the preheated oven until the candy coating is set, about 30 minutes.